Rooting through stacks of old prints for items to form the basis of a unique, low-budget collection, more and more recession-hit Japanese are turning to the late 19th century advertising circulars. Called hikifuda, many of these full-size sheets are signed by known artists (the ukiyo-e world being in serious decline at the time) yet rarely cost as much as USD $100 for a good example in perfect condition. A collector gets an evocative graphic, sometimes lavishly printed, that conveys a feeling for the new, unfettered commercial exuberance of the Meiji era, plus the name and location, writ large, of a specific (and perhaps still existing) family business. Examples of plugs for a particular restaurant or face powder can be found in standard Edo era prints, but it was too expensive, and probably meaningless, for an individual entrepreneur to commission a unique woodblock artwork to promote his firm. With the growth of urban center and all manner and new businesses, however, came a greater incentive to advertise, and along with that appeared the cost-cutting idea of many shopkeepers sharing a single ready-made design. Typically, merchants favored designs that were essentially elaborate, eye-catching borders. This left ample space for the name, description and location of the business. At times, however, they allowed the artist's work to run over most of the page, perhaps hoping customers would appreciate the added beauty. Shopkeepers had a large variety of borders to choose from — immensely popular were the 7 Lucky Gods, ancient symbols, auspicious creatures, images that conveyed Japan's new "internationalism," and of course beautiful women — and new variations of these feel-good themes were added every year. Curiously, today antiquarian stalls have numerous sheets with the message area left vacant. This suggests that salesmen must have scurried around town with "stock books" of blank samples for store owners to peruse. Early hikifuda were executed by the laborious technique of woodblock cutting. This eventually gave way at the close of the century to lithography or combinations of Western techniques — not those treasured today — but the cost was still far from negligible. Instead of ordering thousands of copies of the ad and sticking one into every gateway in town, merchants handed the beautiful sheets only to valued customers and neighborhood leaders. These folk, in turn, were counted on to disseminate the information by word of mouth. Due to such thrift, collectors may encounter the same border design more than once, but rarely the same design/text combination. For a Westerner, the basic design of a hikifuda is likely of paramount importance, but in the domestic market — where the text is more or less understandable — desirability often derives from the name or type of shop, plus its location. Readers of Japanese are also able to pick up strange design/business match-ups in hikifuda. The image of indigo dyers sweating over their vats, for example, may have been chosen as appropriate for a purveyor of fish paste! It is fun to speculate about the proto-Madison Avenue psychological mechanism at work in each such cases. It is a testament to the lasting charm of woodcuts and washi paper that hikifuda have been preserved for our enjoyment. 120 years from now, how many collectors will vie for the advertising flyers stuffed in mailboxes today? The hikifuda shown is a mica-dusted woodblock by the Osaka artist Sadanobu II (1848-1940) and probably dates to around 1880. 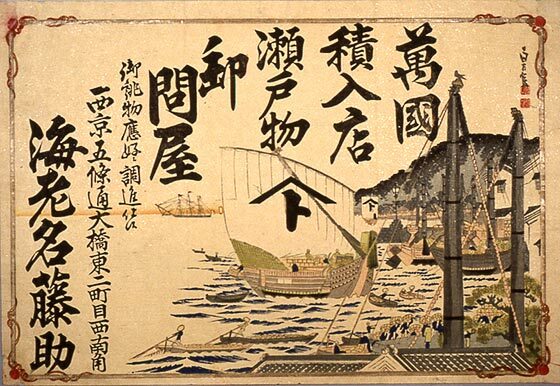 His image of a bustling port scene has been enlisted to advertise a wholesaler on Gojo Street, Kyoto, who deals in custom-designed pottery and imported ceramics "from all over the world." This article originally appeared in Daruma, no. 26, Spring 2000. Copyrighted © text and pictures reprinted with permission.